This tool is located on the Home tab ribbon in Word. 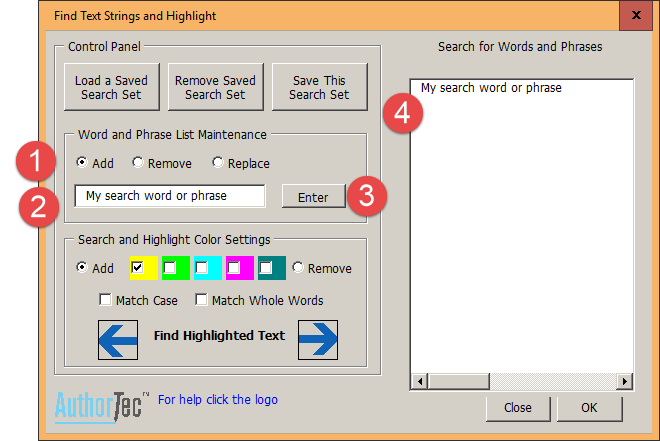 AuthorTec Find'n Highlight searches your document for a list of potential words or phrases and highlights any that are found. AuthorTec Find'n Highlight also provides an easy method of locating these highlighted words and phrases. Load an existing list into the "Search for these ..." list box and then use as is or modify the list. Start with a clean blank list box and add the search items you need, using the Add, Remove, or Replace controls in the Word and Phrase List Maintenance group. Searches can be performed multiple times against the same document and different highlight colors can be used for each search. For example, you can run a search for all adjectives and choose the yellow highlighting color for that search. You can then change the search criteria to all verbs and choose the pink highlight for that search set. 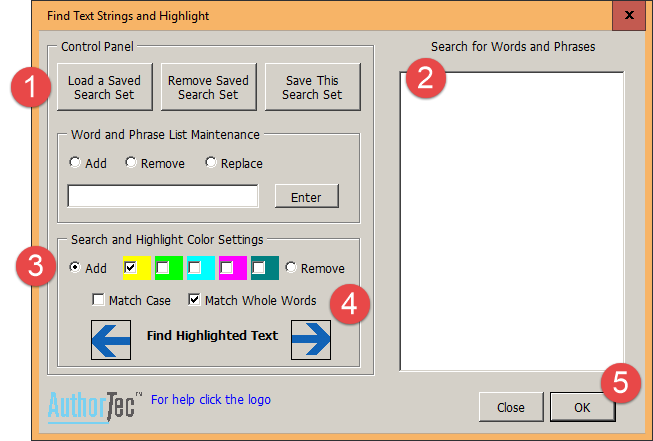 When running multiple searches on the same document using different highlight coloring for each... if the same word or phrase is used in both search sets, then the highlight coloring of the found words will be the last color used. If you have made multiple searches with different coloring for found words, the remove highlighting function will have to be run multiple times using the various colors. You do not have to reload the search set list. The "Remove" highlighting function only looks for highlight colors that match what is selected, it does not look at the word list. The two large blue Arrow buttons in the Search and Highlight Color Settings group are helpful in large documents after AuthorTec Find'n Highlight has found and marked the searchable text. These buttons perform forward (right arrow) and backward (left arrow) searches in the open document for any highlighted text, regardless of color. When you use these buttons, they advance your document to the next highlighted text. If the highlighted text ends up behind the dialog, you can drag the dialog out of the way.